The 2013 Ironman season starts this week with Ironman New Zealand being held in Taupo on Saturday, in preparation I’ve loaded up my results database imported the historical data available on Ironman.com. This is my first detailed look at the event – outside of my own race report and analysis back in 2010 – as last year conditions forced the organisers to reduce the race to the 70.3 format. Not the first time this has happened either, in 2006 the race took on a half-distance bike-run format due to atrocious weather. 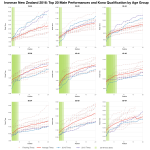 So assuming all is good and the race goes ahead in its full format I’ve taken a look at past race results and what it takes to place in your age group whether for Kona qualification or to gain some Age Group Ranking points. As usual I’ll start by looking at the finisher distributions from the last 10 years of events. These charts give some indication as to the nature of the course and the level of competition. Factors like how widely the results are distributed or the skew of each curve hint towards the nature of the race – a strong left skew might suggest a faster course while a narrower distribution points towards faster competitors. New Zealand is not a fast course. Roads are rough, winds tend to be high, this is not the PB territory of European Ironman. 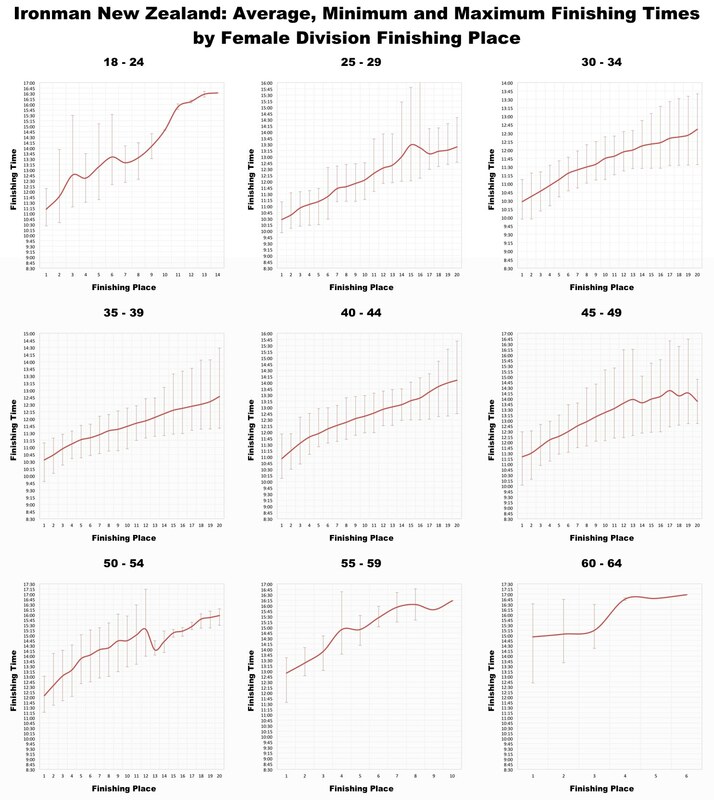 These slower times are offset, to an extent, by the quality of age group athletes racing. The field is strong and competitive at the front which means with only 40 slots for Kona available it takes a top performance to grab one. 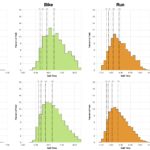 Predicting age group Kona qualifying times is next to impossible, but I can use the historic results to get a feel for the kind of performances necessary to gain a slot. 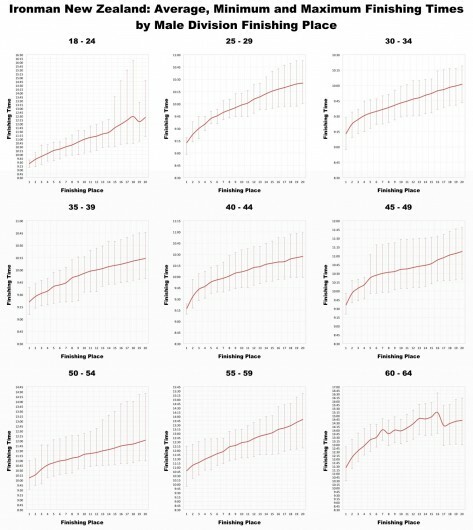 The simplest way to do this is to look at the average time for each place in each age group as the two charts below do. 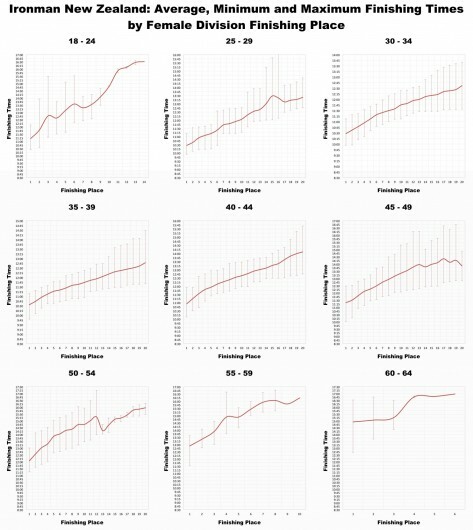 For each age group a graph plots the average finish times for the top 20 placings with error bars indicating the minimum and maximum finish times for those placings too. So, for example, I can see that my 9:31 in 2010 was one of the fastest 10th places in the 30-34 year old division. Were I racing again this year and hoping to go to Kona I would be in competition for one of 3 slots available in the 35-39 category; chances are I’d need to finish in the top 3 in my age group, as the graph above shows that probably means a 9:15-9:30 finish time. No chance! It comes down to race day of course, there are no guarantees. 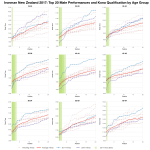 At the very least it provides an indication as to the kind of performances that Kona qualifiers are putting in at Ironman New Zealand. 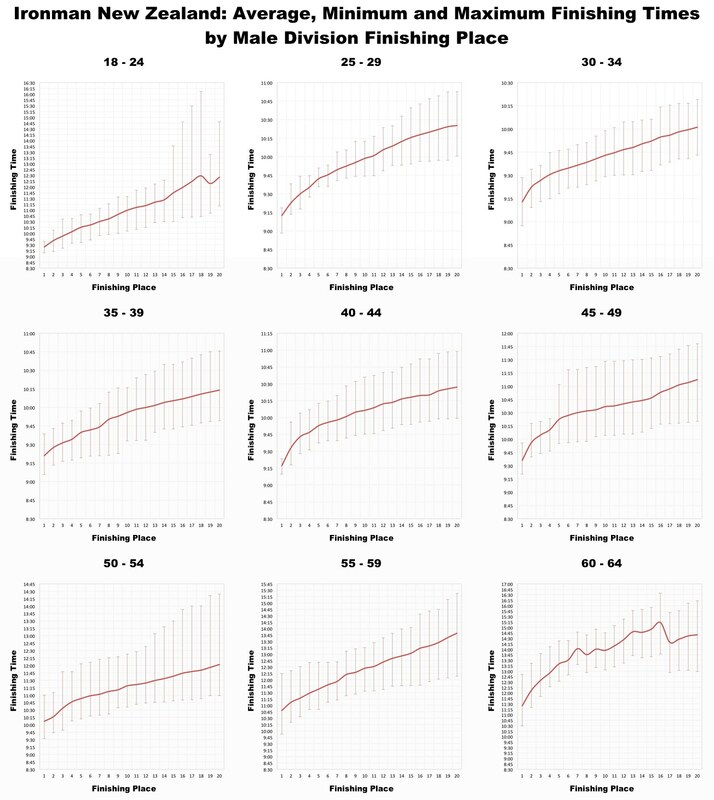 This will also be the first full Ironman to contribute to the new Age Group Ranking system, points will be scored for places, and again these curves give some indication of what’s needed to earn big points. For the professional side of the race, Thorsten has some excellent analysis, particularly his usage of my race breakdown graphs to predict how Saturday’s race might unfold. I will be retrieving and analysing the age group results over the weekend as normal so we’ll see how 2013 stands up to the past.